Printing Equipment: Lease or Buy? Printing Equipment: Lease or Buy? Printing Equipment: Lease or Buy? Leasing and buying printing equipment each come with their own distinct advantages. You’re going to need print finish equipment if you’re going to support a printing business, and like any savvy business owner you’re probably on the lookout for the best deal. Which begs the ultimate question, should you lease or buy the equipment? Unlike other technologies, print finish equipment doesn’t change all that much. It is quite possible to buy a piece of print finishing equipment have it last… well, forever. So how do you know whether to lease or buy? Here are a few factors to consider. Leasing equipment comes with the advantage of requiring less upfront capital than buying outright, and it can also provide you with a trial period to determine which equipment is best for your needs. If you’re leasing a specific type of equipment but later determine that your needs have changed, you can easily change from leasing one machine to another. Some printing equipment technology is still changing because it is relatively new, such as UV Coating machines. In these cases a lease would also make more sense. Maintenance costs are also sometimes included in leasing agreements, meaning you can save money and time if a machine breaks down. While leases have many advantages, it’s important to keep in mind that they come with additional monthly overhead. Furthermore, when you buy print finishing equipment the price is fixed. Leases, on the other hand, can be subject to price increases. It’s a good idea to research your needs in order to determine whether the cost of buying outright will outweigh the potential cost of leasing. 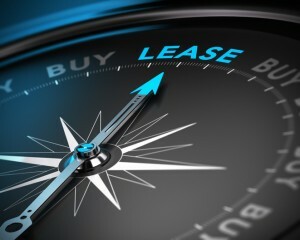 Leasing is a particularly handy a flexible option when it comes to business growth. If you land a big job for a prestigious client that requires additional equipment, you can easily arrange to lease a new machine for the job. Many business opt to buy their core print finishing equipment and lease out all the nonessentials, or lease until they can afford to buy. It’s also worth noting leasing and rental costs can often be counted as business expenses, which are tax deductible. If you buy equipment you can count it on your taxes for that year, but leasing costs can count every year that you lease. This entry was posted on Thursday, August 4th, 2016	at 3:29 pm	and is filed under Blog	. You can follow any responses to this entry through the RSS 2.0	feed. Both comments and pings are currently closed.